Salkantay Trek is a must if you visit Peru, but for it to happen you better put as many alarm-clocks as you can ‘cause day starts early. 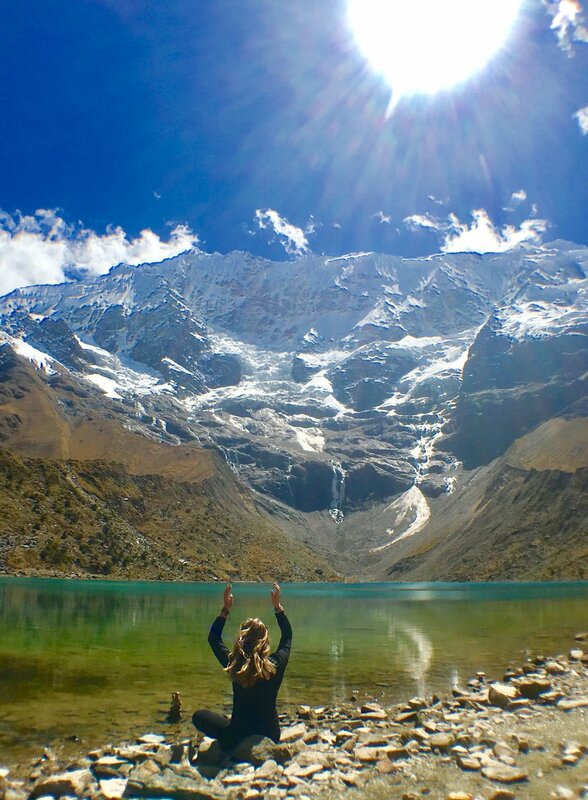 There are several local companies and travel agencies that do the “Humantay-Salkantay Lake tour”, although I recommend you choosing “Soncco Tours”, in my experience they were amazing with everything. It was 4:30-5:00 am and the mountain guide and driver picked us up on a minivan/bus at our hotel. First stop of the road trip was Casa Salkantay at Mollepata - we ate some typical and exquisite Peruvian breakfast with the amazing view of The Andes. The Casa it’s located in a little village with warm, kind people; the children living by played and laughed with us and other travelers. The bus trip continued to Soraypampa located at 3,920 meters above the sea where we arrived at Sky Camp, a little rustic town surrounded by the majestic snowy mountains and mystical air with several rural cabins to stay the night and admire the stars as spectacular as they are, but that's where the hiking begins. With a 20 minutes leg stretching, we prepared ourselves for the trek upwards the lake. On our way crossing wonderful landscapes, the guide told us all about Humantay Lake; the lagoon has been shaman territory ever since it was discovered. One thing our shaman teacher told us was the custom of making offerings to Pachamama, Mother Earth in the Inca Culture, on the journey up. Carrying a rock up until the lagoon and placing it in form of a totem, thanking for successfully arrived and celebrating life. That ritual was one of the most amazing memories I have, taking the rock all the way up and not letting the totem fall was such a challenge, but mostly learning all about the Inca culture and being present in the cleaning of bad vibes was so impactful. The view of the lake being 5,473 m above the sea is so peaceful and quiet, you just want to stay there forever. But if only I knew the hike downgrade was almost as hard as the one upward, the thing is, it’s not the kilometers you walk/hike what hits you - its the altitude. Our salvation was chewing some coca leaves all along the journey. After arriving at the Sky Camp again, Sonoco team had some lunch for us and were ready to get back to Cusco around 6:00-7:00 pm.